by Diane - March 12th, 2014. 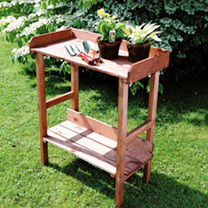 This robust potting bench would be an invaluable addition to any shed or greenhouse. 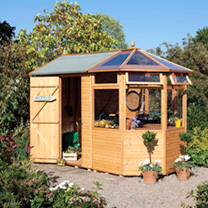 Made in the UK, from pressure-treated FSC certified wood, it has a convenient height top shelf for potting and a lower shelf for storage. Flat packed for easy home assembly. Measures 76cm (30) wide x 37cm (15) deep x 86cm (34) high. « Wish list – everyone should have one!